Metro is half-finished building the Crenshaw Line, the transit system’s next rail project. Expected to open in two years, the light rail will connect the Green Line to the Expo Line, traversing neighborhoods like Baldwin Hills, Leimert Park, Fairview Heights, Hyde Park, Westchester, and Inglewood (yes, we know Inglewood is its own city) and offering a connection to the forthcoming LAX people mover. Stretches of Crenshaw Boulevard are still torn up—as the line operates as a subway through Leimert Park and Baldwin Hills—while above-ground stations are in embryonic form. 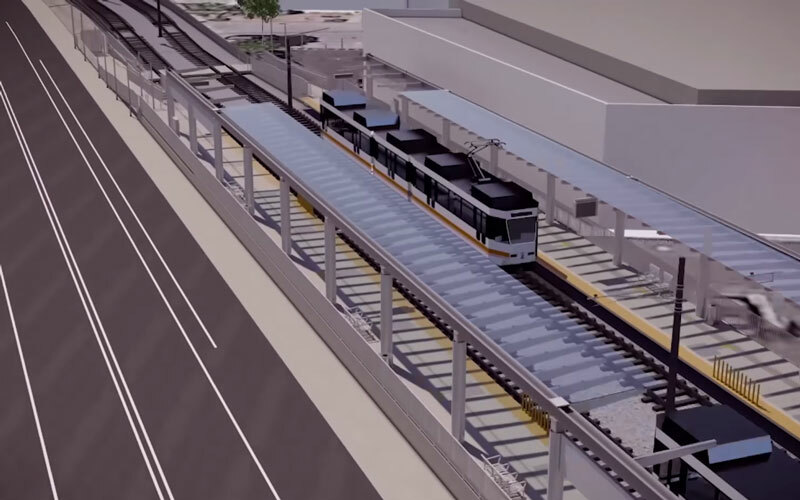 To get a feel of what this new 8.5-mile line will actually look like, check out this incredible video made by students at LA Trade Tech Community College, through a partnership with Metro. The clip includes accurate depictions of much of the line (assuming final engineering doesn’t change at the last minute), though leaves out the future 96th Street station, which will connect to the people mover. It’s clear the Crenshaw Line will transform commuting in southwest L.A., making it much simpler to get to Santa Monica, DTLA, and LAX (and eventually Beverly Hills and, possibly, Hollywood when the line is extended north). But the transit line is also going to greatly impact the community directly, ushering in new housing, retail, offices, and, likely, gentrification. The Expo Line opened at Crenshaw Boulevard four years ago, making the area less land-locked and hemmed in by the clogged 10 freeway. Plans for a huge new shopping plaza just south of the Expo station were in the plans for years, and was recently retooled as a mixed-use project. A new medical center near the Macy’s-anchored Baldwin Hills Crenshaw Plaza—which recently spent $35 million on upgrades, and plans much more—is under construction. Metro is looking to develop nearby plots they own near the train stations. In case you just woke from hibernation, Inglewood is building a new football stadium for the L.A. Rams and developing one of the largest mixed-use projects in L.A. County history. Even without the Crenshaw Line, this area was already experiencing major growth.